I am sharing a card today that was almost a month in the making. 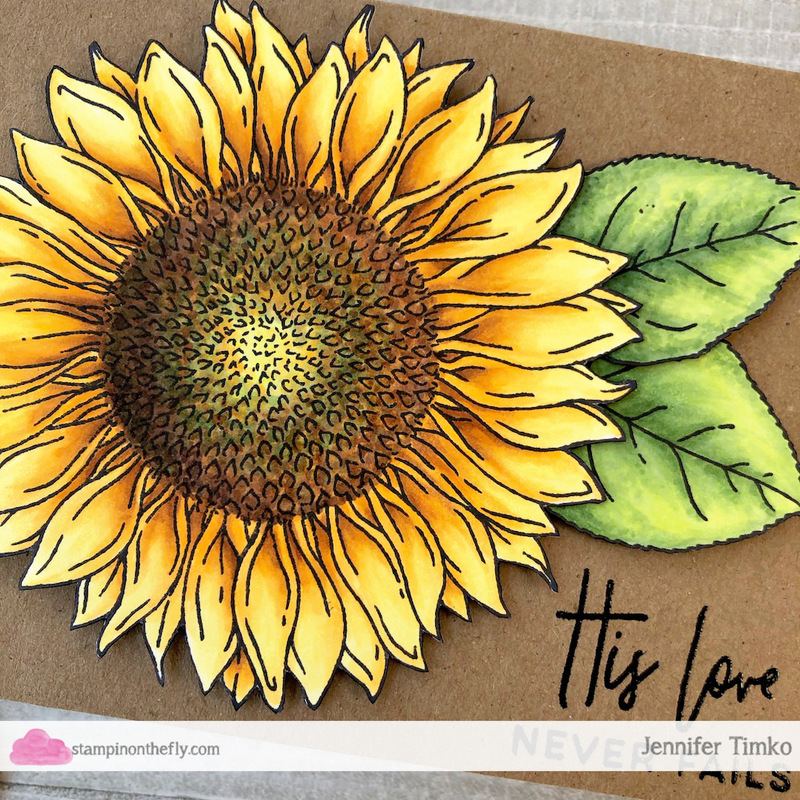 If you follow me on Instagram, you probably saw my progress on coloring Taylored Expressions’ gorgeous Big Bloom – Sunflower image over the course of the Daily Marker 30 Day challenge in February. I did a little at a time and tried to just enjoy the coloring process where it fit in. 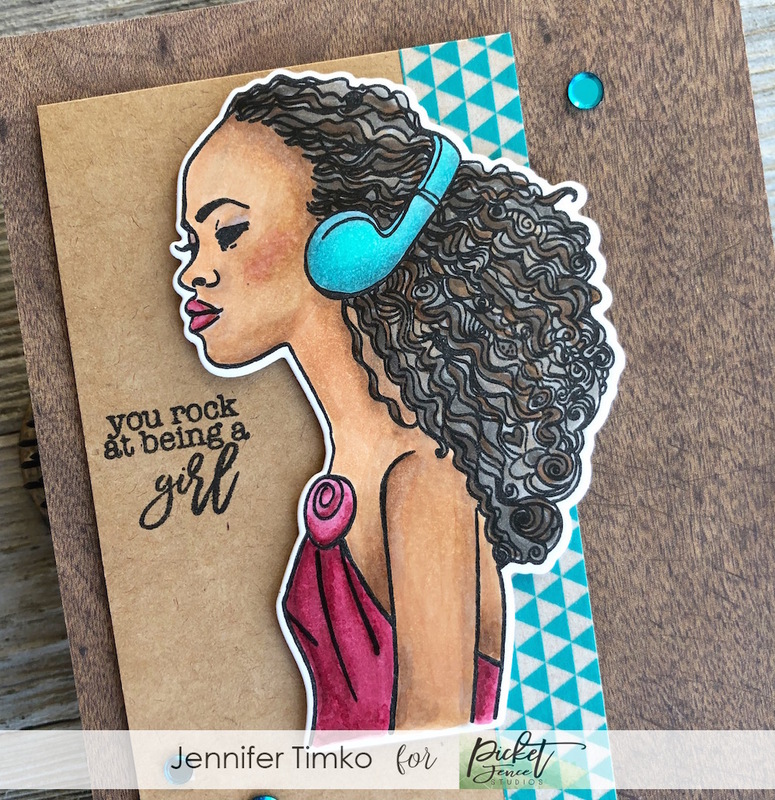 You see, a year ago I had just attended the amazing Stamping Away retreat and the lovely Jen Shults had stamped a few extra images for me from her incredible Taylored Expressions stash. Yes, it took me a year to finally decide to tackle this flower (and yes, there is actually another one for another time). I am so grateful still for that retreat time and for all the inspiration I received. After all the coloring, I finally had time to finish the fussy cutting and figured out what I was going to do with the image. 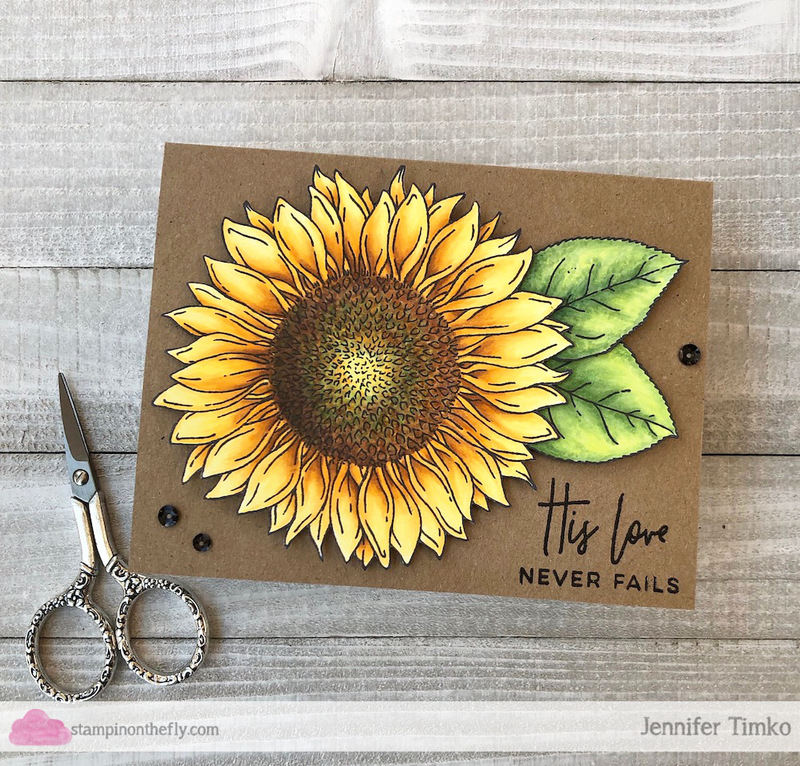 I thought that a basic kraft card stock was perfect under the earthy tones of the sunflower and I chose a simple sentiment by Right At Home from the His Love set. It was really nice to make a card just because. No deadline, no particular purpose (although I think I have a place for this to go now), just for me to have fun coloring. I am committing to do that a little more where it fits in because it makes me happy! 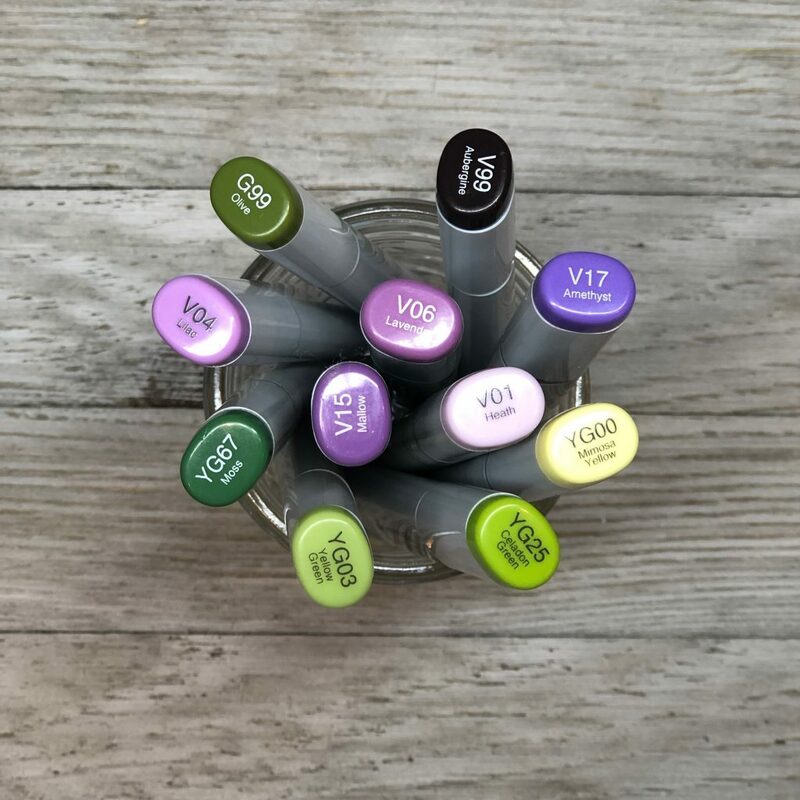 Now there are a ton of Copic Markers that were used to create this. 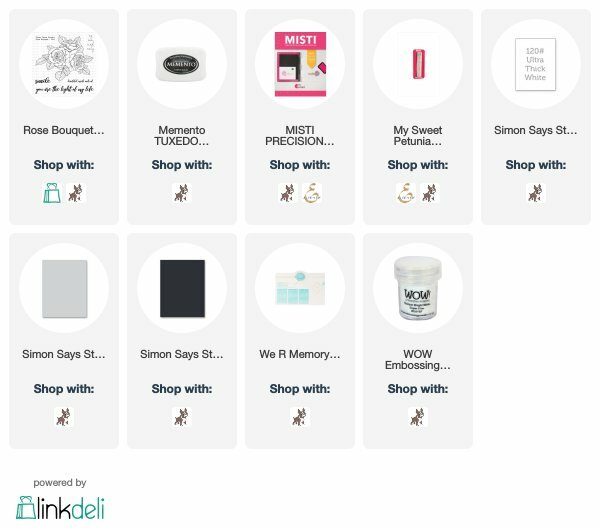 I have linked a few below in my Link Deli but I will also just simply list them for you for simplicity. I don’t think I have ever used this many markers on anything but it was worth the complexity, I think. I’m out on a trip and more flying next week but in between, I will be getting some projects done for Picket Fence Studios and the March release. I hope you have an amazing weekend and I’ll see you soon! Thanks for stopping in today. 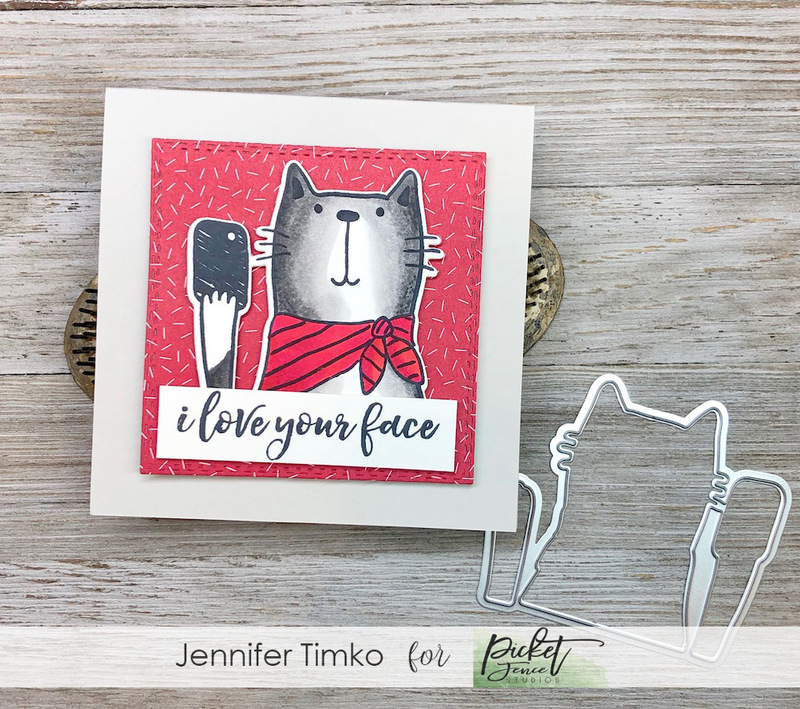 Picket Fence Studios February Release Day! 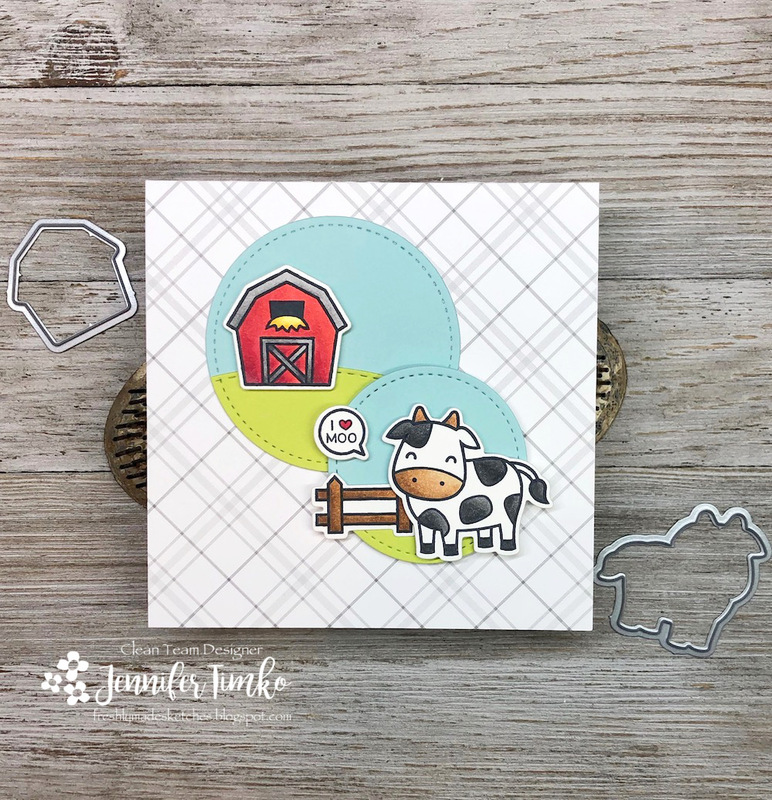 Picket Fence Studios February Release Day! 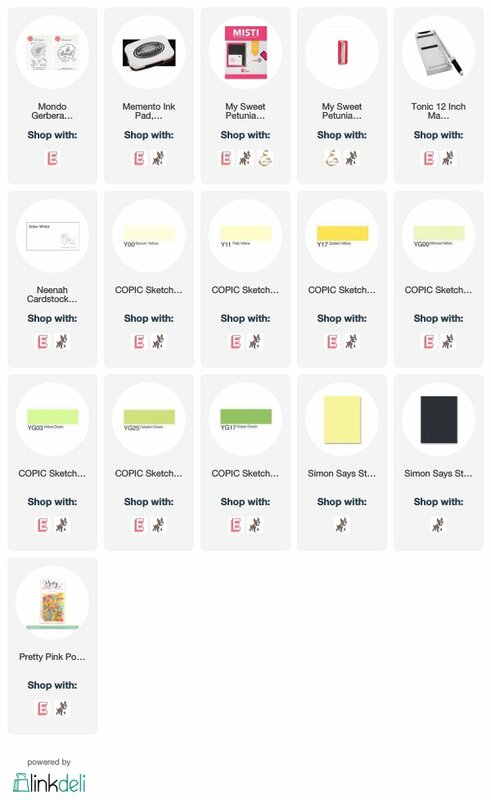 published on February 14, 2019 Read more posts by the author of Picket Fence Studios February Release Day!, Jentimko3 Comments on Picket Fence Studios February Release Day! Hi everyone! 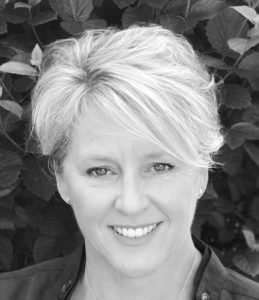 It is one of my favorite days…release day! 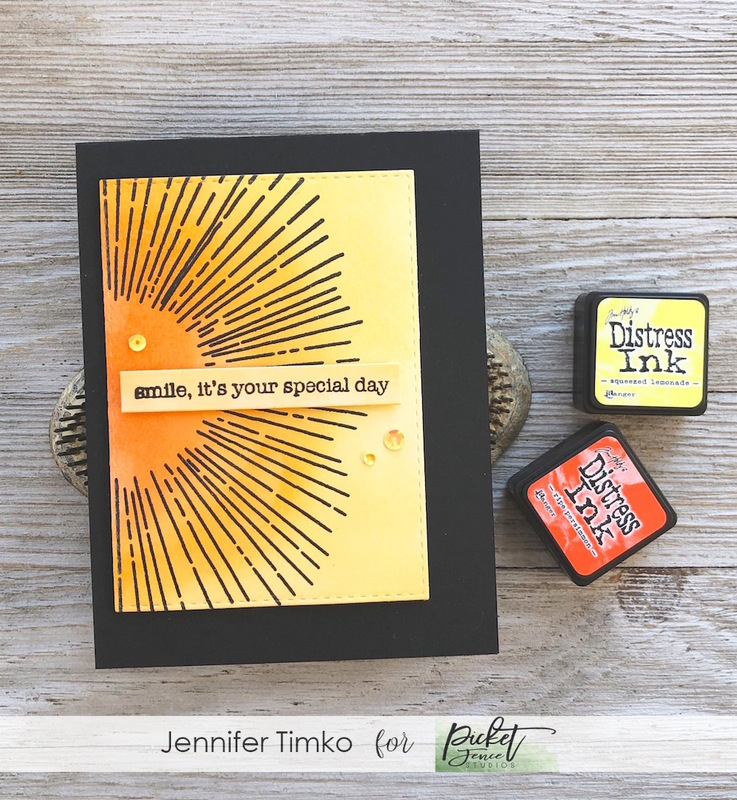 Every single month Picket Fence Studios gives us so much to use for creating and this month is no exception. Another amazing release!! So I’m going to get right to my cards. 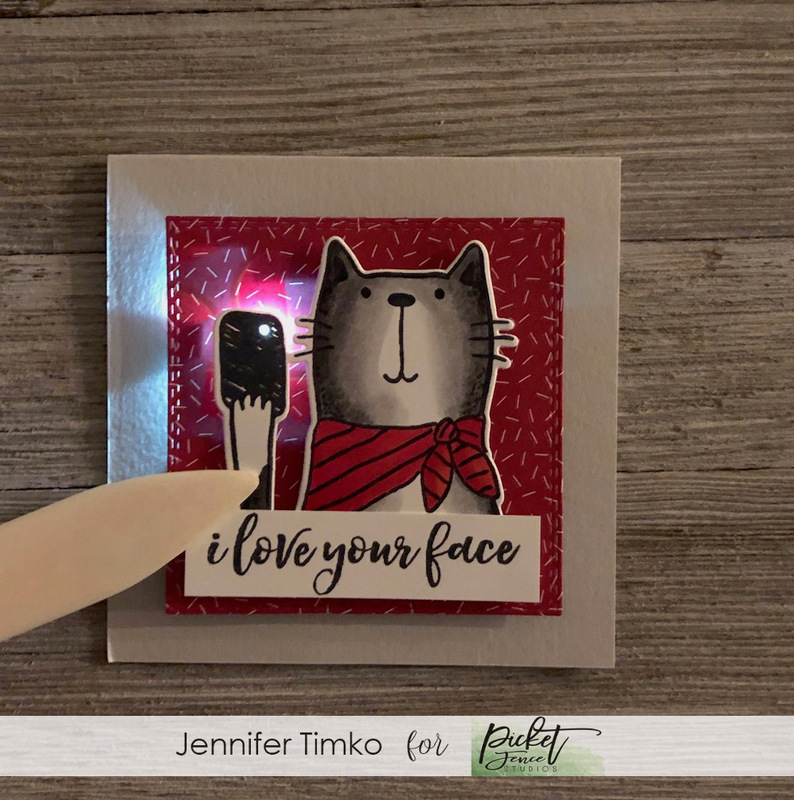 First up, I used this super cute selfie cat to create an interactive card. The name of the stamp is I Love Your Face and it is such fun. I colored the kitty to look a bit like my little Meg. We decided that Kate is far too dignified for selfies but Meg, well, she would totally be taking them! But then I wanted to take it a step further. So I created an interactive light up card using Chibitronics Chibi lights. So when you push the cat’s paw, the camera “flashes”. I used my bone folder here to keep my hand out of the way. I dimmed the lights a bit too so you can see the light better. I’ll post a quick video over on my FB and IG pages later today. The foundation of this card is pretty simple. I used stitched dies to cut out the square of patterned paper. Then I used the actual die and traced inside it to make sure I knew where my boundaries are. I built the simple circuit and then poked a small hole in the paper under the cat’s paw so the light could shine through well. I think this is fun for anyone, don’t you? 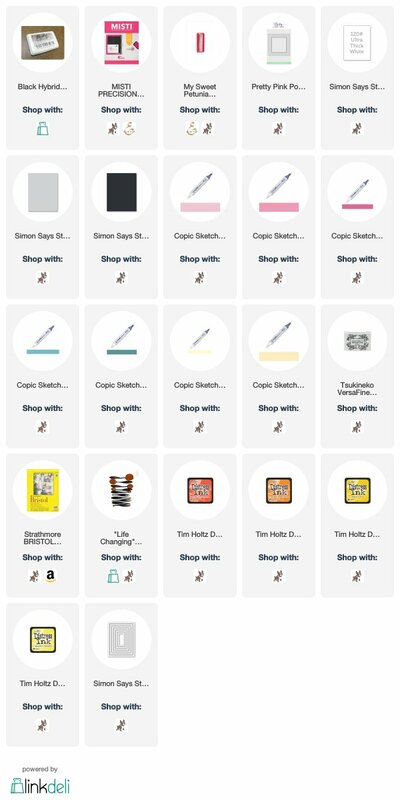 Next up, I chose a set from the “Girls” series and this one is called Shop Hard. Now, I chose this image because it reminds me of one of my neighbor girls. So much so that I showed her mom (and mom agreed). This girl is like family to us and she is such a beauty. How could I not color her?? So out came the Copics and I chose some colors I thought would be right. While I love the sentiments in the set, they were not quite right for this girl (she is a super athlete and doesn’t have much time for shopping). Instead, I chose one from the new set called Let’s Shake Our Tail Feathers. I think it is perfect for a teenage girl! The whole team will be sharing today and I hope you enjoy my cards. 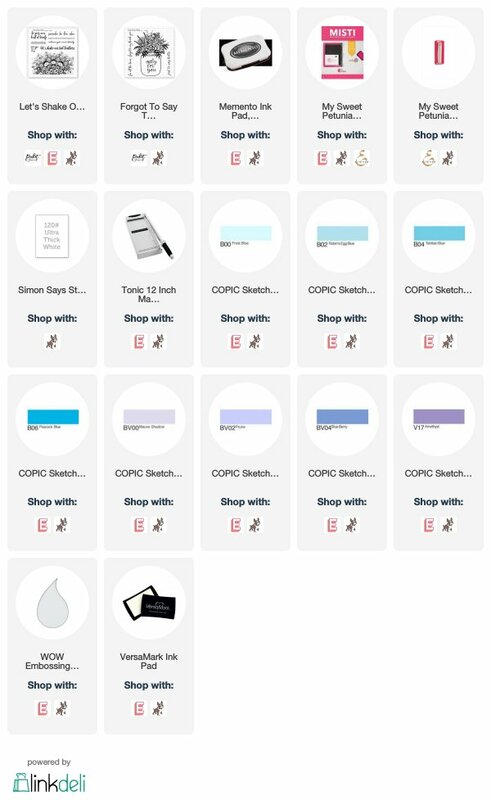 Make sure you go check out the whole release over at the Picket Fence Studios site! Thanks for stopping in today. See you soon! 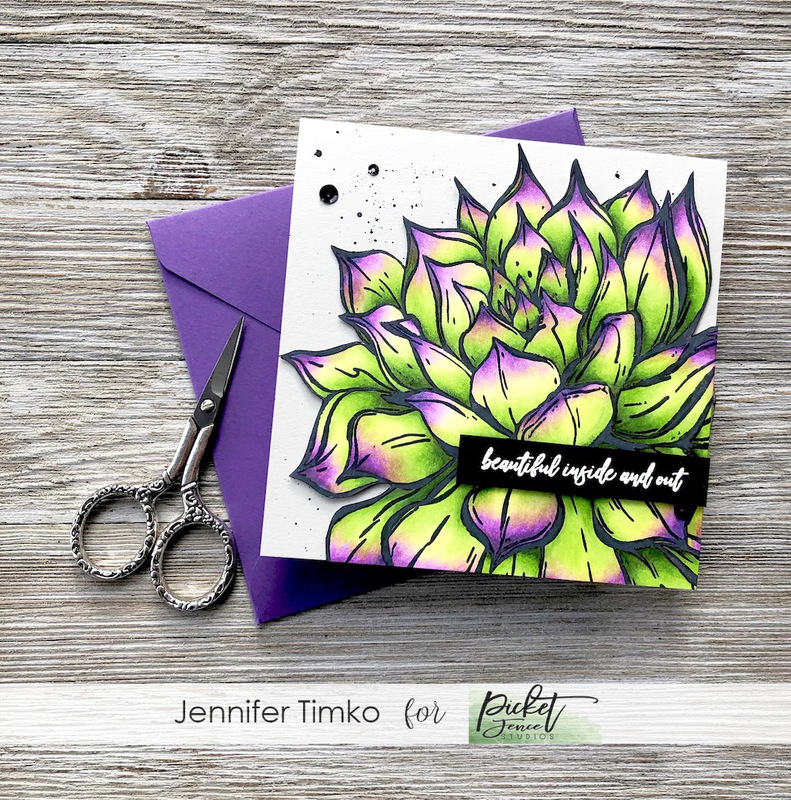 As promised I’m back today with more details on my card using the new Aeonium African Succulent set from Picket Fence Studios. 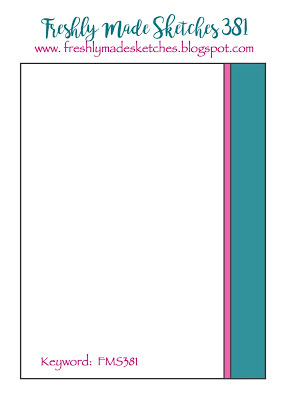 So the second I saw this, I knew the color palette that I wanted to use. Why you ask? 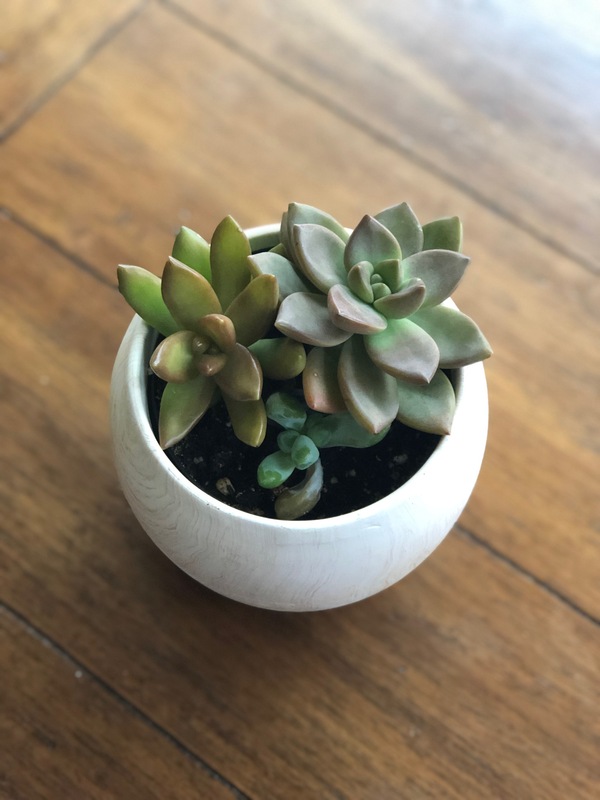 Because I have a little set of plants on my kitchen table that were chosen by my 12 yo son. He is a total character and he has a tendency to name things. There is no rhyme or reason to the names but they are always funny. So introducing Timmy, Jimmy and Timmy Jr. While I was coloring the image, he would come down as ask me how Timmy was doing. Or I’d say I was going to hang out with Timmy. To be fair, the coloring of this happened over about 4 days. No, it wasn’t a whole 4 days….I just did it in bits and pieces because it does take a bit of time and blending. But oh is it worth it!! After I was done with the coloring, I cut the image out. I debated cutting the size down but just couldn’t bear to lose any of the image. 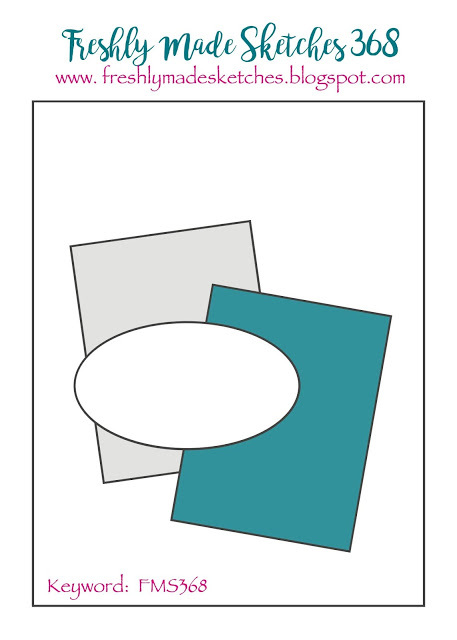 So instead, I chose to make a 5″ x 5″ card. So what about an envelope for that? No problem. I made one! I used an Envelope Punch Board and some pretty purple card stock (Gorgeous Grape by Stampin’ Up) to create one that is perfect for the card. Behind the image I used Fog Gray card stock to give a little richness and depth without taking away from the image. I splattered it with ink before adding the image. 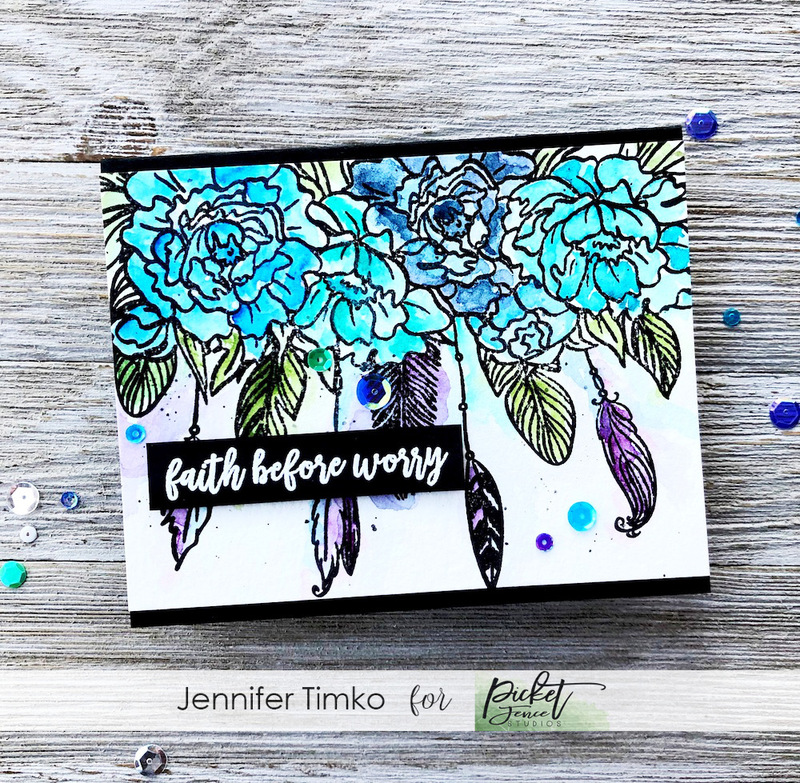 The sentiment comes from the Rose Bouquet set (should look familiar, I used it on Friday) and I simply put it on black card stock with Versamark and heat embossed in white. I added a few sequins, of course, to complement the splatters. I hope this card inspires you to get out your Copics and mix colors. It is easier than you think! Even with green and purple (see Lydia’s discussion on breaking the “rules”). I’ll be back tomorrow with another of the cards from the release. See you then! Kiesha Rocks! 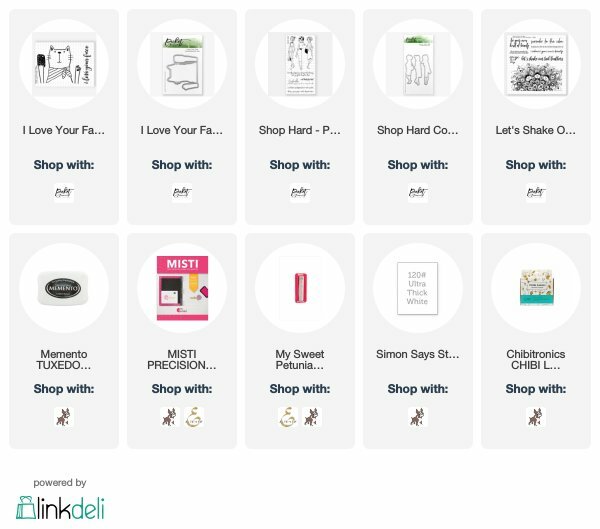 published on December 28, 2018 Read more posts by the author of Kiesha Rocks!, Jentimko1 Comment on Kiesha Rocks! Happy Friday everyone! 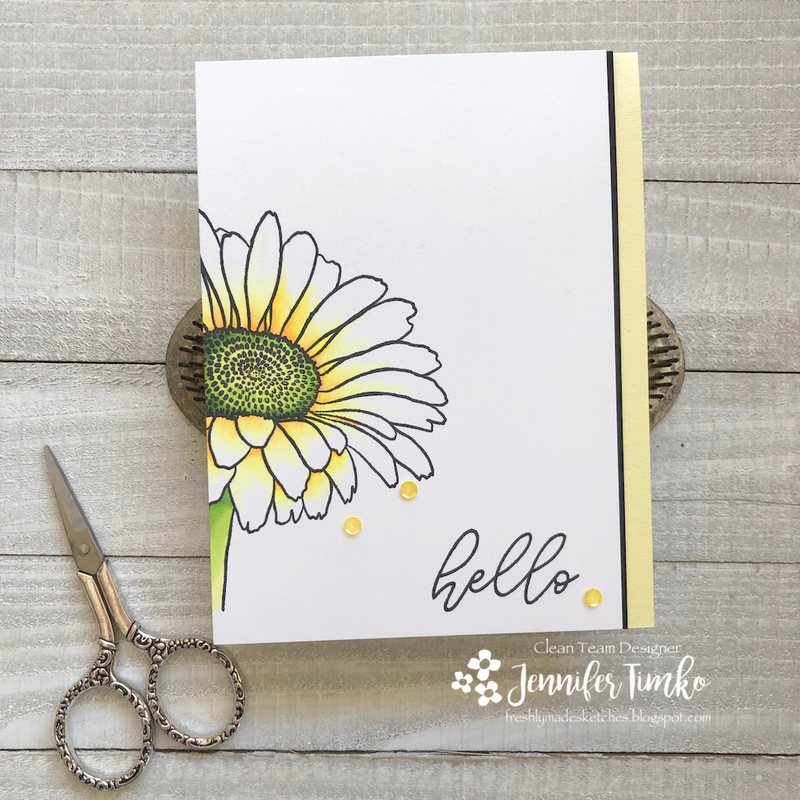 A quick post today to show you a card I’m sharing over at the Picket Fence Studios blog today! I got a little bit of stamping time and I just HAD to color this gorgeous new girl named Kiesha! I stamped Kiesha using the Picket Fence Hybrid Ink with my Misti. Then I started playing with her shading. I learned something from Lydia recently about adding a violet hue to ethnic skin colors for depth. Wow, what a difference a little makes! Once I had her skin tones like I wanted, I delved into her hair. Just look at the lovely art there! All the details in the image are mesmerizing. I played with grays and browns to create some highlights. Still need to work on the shading for dark hair but I’m overall happy with my first attempt on this image. I hope you like this one too and I look forward to hearing your thoughts. 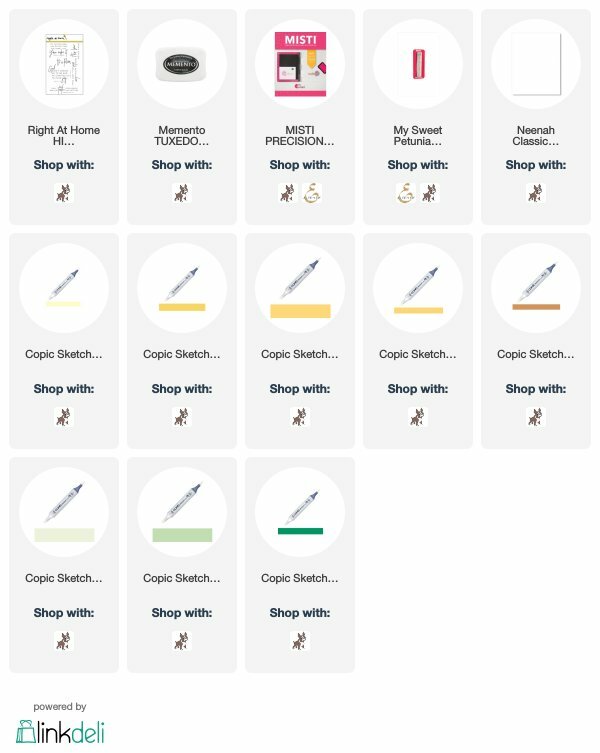 Make sure you go check out the whole line of “Girl” stamps too. They are all gorgeous!! Thanks so much for stopping in today. I hope you have a fabulous day! 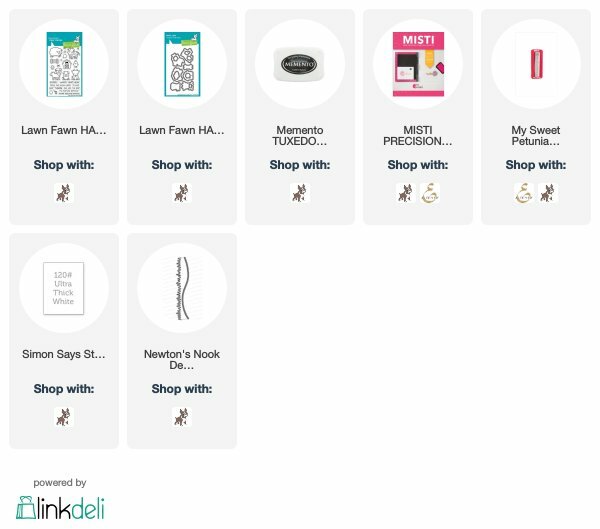 So….how is your holiday prep going?! I’m going to say that things at my house seem to be a little crazy. Truthfully, it has been a bit difficult getting things moving for us with all the loss we have had over the last few months. But I keep telling myself that we have to focus on the real meaning of Christmas. We have so many blessings, the biggest of which is an amazing family. How lucky I am! Today I have the last Freshly Made Sketches challenge for the year. The team always takes the holidays off but we leave our sketch open during the whole time so that people can play along. Hopefully you will have some time to join us! Our sketch is courtesy of the lovely Narelle Farrugia. 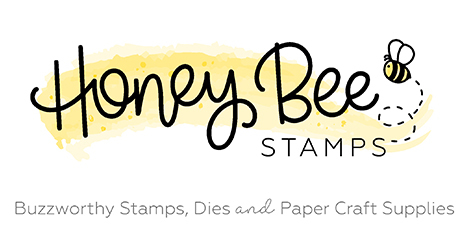 She is one of the newest Artisan Design Team members for Stampin’ Up and I’m so thrilled for her! 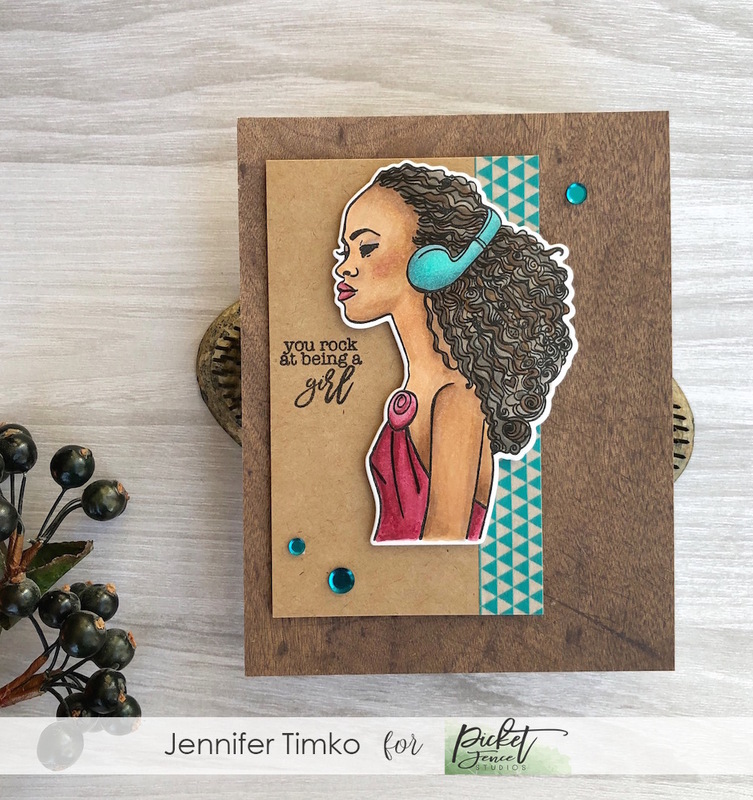 She has mad skills so it is no surprise that she gave us a great sketch with lovely layers! 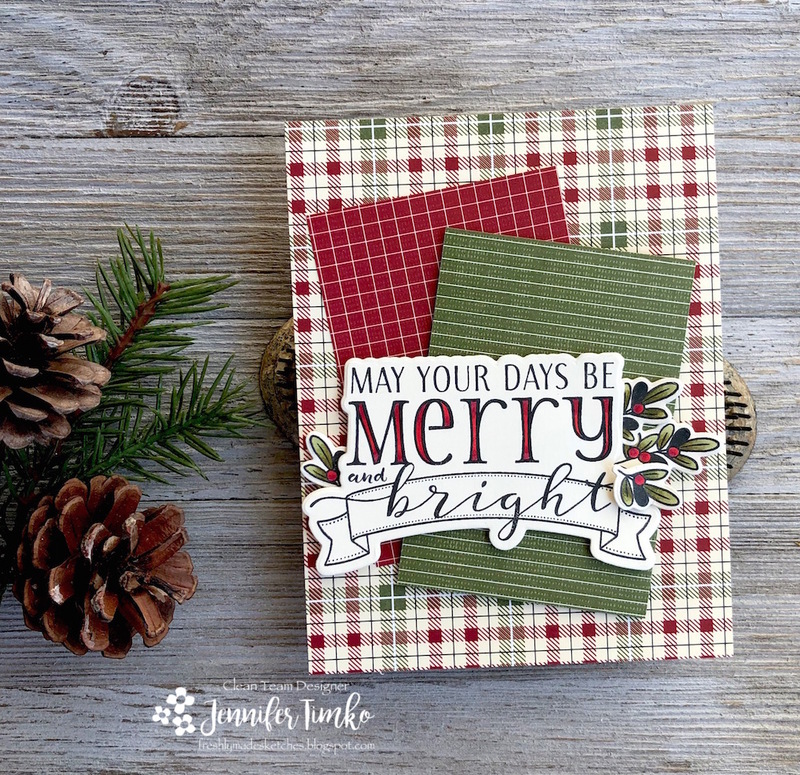 With the layers on the sketch, I thought that this great patterned paper from Stampin’ Up would be perfect (Festive Farmhouse). I just chose a plaid that I liked (there are a few) and then two prints that went with it. Because the base of the plaid is vanilla and not white, I used some Thick Very Vanilla card stock (also SU) to stamp my sentiment and images. I colored the little leaves and berries using Copic Markers to add a little bit of detail. But let’s face it, the sentiment is the star of the show! At first I had it without coloring but when I mocked up the card, it seemed a little too plain. So I added additional coloring to the letters to help it pop. And you know what else??? I think this is the last Christmas card of the year for me. I’ll admit that I didn’t make nearly what I normally do and I didn’t send out handmade cards to my entire list. But sometimes you just have to accept limitations and move along. I hope to have some other cards to share with you over the upcoming weeks. 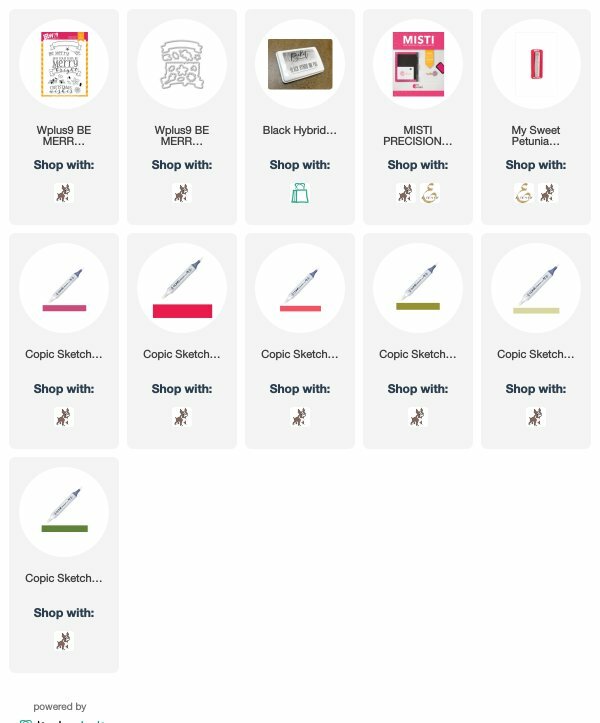 I’m still playing with the new release from Picket Fence Studios and I have some unused stamps that have been calling my name to be used. Wishing for you that your last days before Christmas are merry and bright! See you soon! 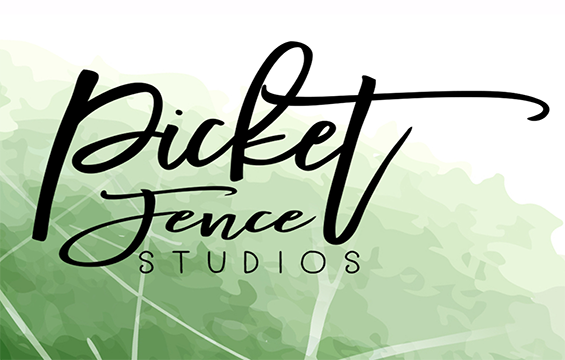 It is the 14th of the month and that means today is a super fun day at Picket Fence Studios! Time for the December release!! I have two cards to share with you for the release and I know the team will have lots to share too. Let’s get started with this ADORABLE image! Oh. My. Word. So cute. And such fun to color. I stamped her in the Black Hybrid Ink and then colored with my Copic Markers. Super awesome news here too….there are dies on every release now. I do love a coordinating die!! 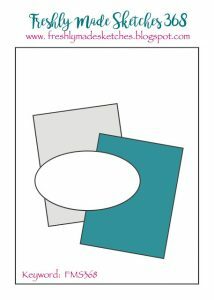 So I cut her out with the die and decided to keep the rest of the card simple so as to focus on the image. I cut a scalloped frame and stamped the sentiment from the same stamp set. With all the Christmas cards I have been trying to make last minute, this release is a great change of pace! 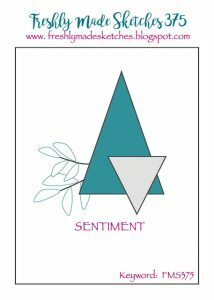 With my next card I tried to do what I never do enough…make a masculine card. 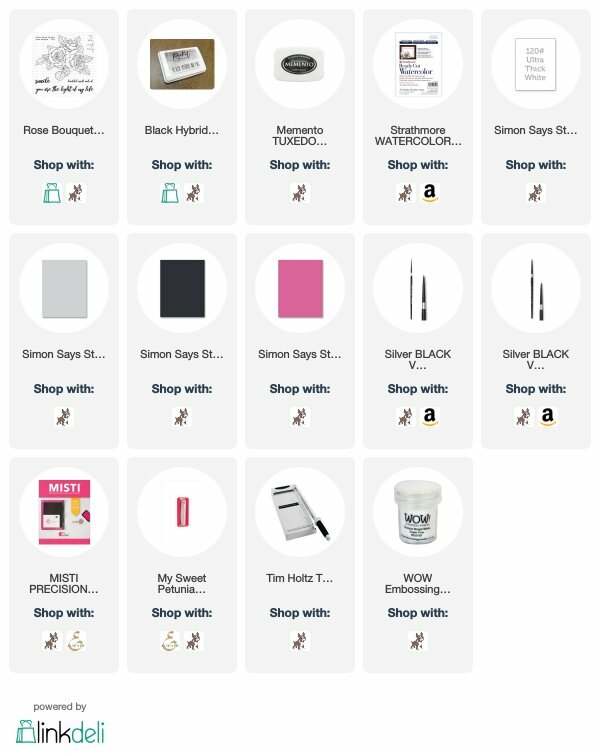 I have so many men in my life that need cards so you’d think I be a pro but nope. I thought this set really called for me to give it a go. I stamped in Versafine Ink (because it stays wet long enough to emboss) and then heat embossed with clear embossing powder. Out came the Life Changing Blender Brushes again and I blended on oranges and yellows until I was happy. I cute my inked panel down with some stitched rectangle dies and then used part of the cut off piece for the sentiment panel (all the coloring was done, after all). I found some sequins in my stash that matched and then put the panel on a black card base. My high schooler agreed that it looks like a “man card” so I’m going to call it mission complete. 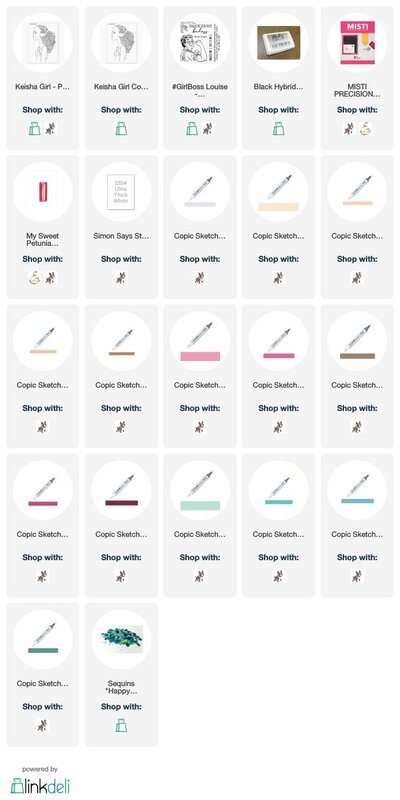 Make sure you hop over to the Picket Fence Studios site to see the whole release! You will love it! Thanks for stopping in today. Hope you have a great weekend.